Disney has so many cool toys, and for this reason, when it comes time for a child to spend that allowance, they’ll stand in the aisle forever as they’re trying to pick the toy they really want to take home with them. 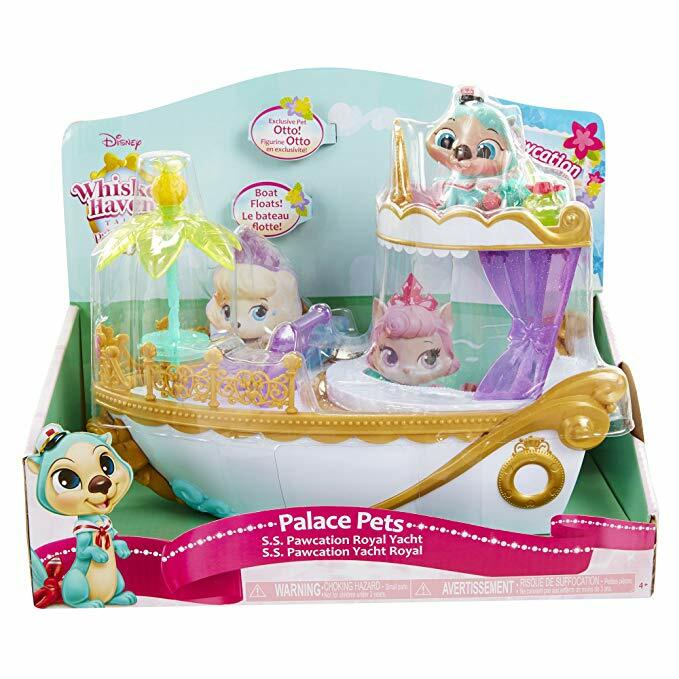 If your child has an allowance and she’s looking for a new toy, then we recommend Disney’s Palace Pets – S.S Pawcation Royal Yacht because it truly is adorable. What is Disney’s Palace Pets – S.S Pawcation Royal Yacht? Your little girl can set sail aboard the Whisker Haven Tales Palace Pets S.S Pawcation Royal Yacht. This yacht is based on the Disney Junior series called Whisker Haven Tales with the Palace Pets. What’s really cool about this toy boat is that it can really float in water. For this reason, it is fun for the child to play with during bath time, and she can take it to the pool with her during pool time. The child can use it out of the water as well, making for imaginative play. What Does the Boat Come With? The boat comes with an exclusive figure of Otto, which is one of Ariel’s pets. There’s a story on the back of the package that tells us how Ariel was singing on Prince Eric’s ship when she heard another voice – it was Otto singing along with her. This is a shiny otter pup that is wearing a sailor’s hat with a glittery pink bow on its sea-green tail. Children can have fun with Otto and let him man the wheel of the ship, or let him take a dip in the paw-printed shaped pool that can be filled up with water. Otto can even take a sip from a fruity coconut drink or rest on the glittery purple lounge chair. The set also comes with a neat looking pineapple table with a palm tree umbrella that can be attached behind the wheel or at the front of the ship. Is This Toy Fun to Play With? If your little girl is a fan of Palace Pets, then yes, this will be fun to play with. This one adds the exclusive Otto figure to their collections. With everything available here, and by using their imagination, children will get the opportunity to play many different types of sea-faring adventures with this toy. Due to the fact that the boat can float, children will be able to play with it in the tub or at the pool, but don’t worry, because it is just a much fun when they’re on dry land. Children can play out what they seen on the television show or make up their own Pawcation-themed stores. Plus, we also have to include the fact that there’s going to be some pretty awesome character roleplay here due to Ariel’s pets. This toy is for ages 4 and up. Children that enjoy collecting the Disney Princess Palace Pets toys and watching the television show are going to enjoy adding this to their collection of toys. Just imagine all of the sea-fairing adventures with Ariel’s pets! With Disney’s Palace Pets – S.S. Pawcation Royal Yacht, every day for the little one is going to be a day that is packed full of magic. There is so much room for imagination here – you’ll just have to watch your child play with it in order to believe it. exclusive Ariel's pet otter, Otto figure!